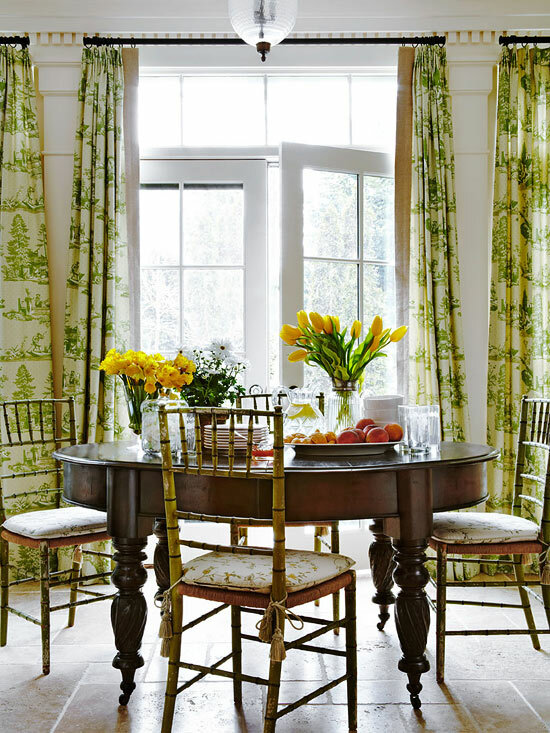 Hampton Summer Home with Cheerful Breakfast Room, Green/Ivory Draperies, Embroidered, Green/Ivory Toile by Jack Fhillips Design, Inc.
Fresh summer design trends are more than ever being shaped by the styles we love throughout the year. 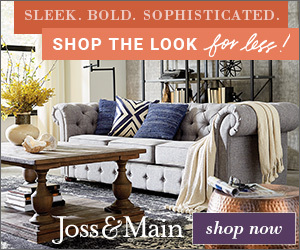 This summer home is a perfect example of finding that sweet spot between how you choose to decorate your permanent residence and your summer home by extending the style you love in a way that is suitable for lighter summer life. 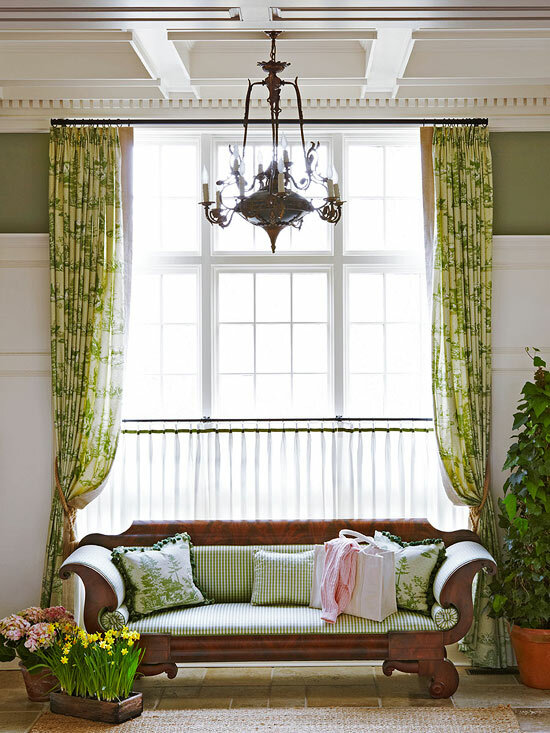 Two-Story Living Room, Cotton Fabrics Bring Summer in by Jack Fhillips Design, Inc. The summer home featured in this article accomplishes this extension of style extremely well. By using natural elements such as light, color and cotton fabrics contrasted with deep mahogany tones the designer bring a fresh, open and inviting feeling to this home. Hampton Summer Home with Gingham Cushion on Mahogany Empire Settee by Jack Fhillips Design, Inc.
Jack Fhillips of Jack Fhillips Design, Inc. designed this home featured in Traditional Home. 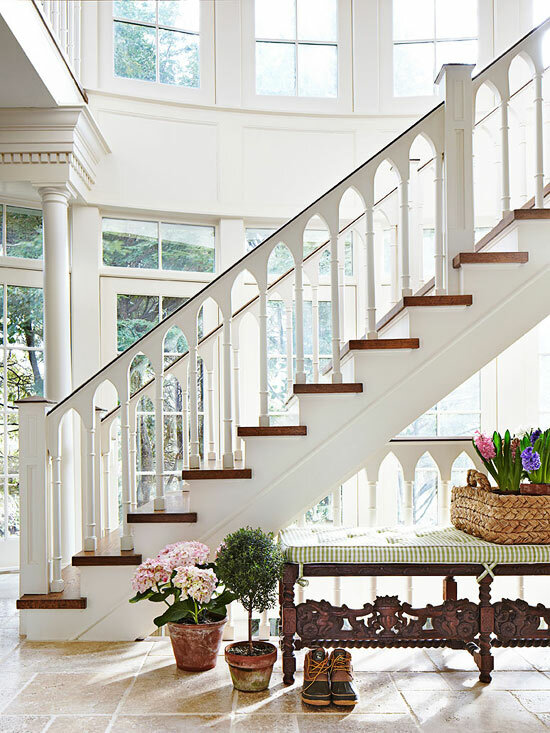 A truly inspiring transformation of a beach home located in the Hamptons, this English Tudor Style residence portrays a subtle elegance layered with comfortable accessories that give the traditional furnishings a visual lift. With the use of color, textiles and exquisite accessories every space sends the message of summer ease and elegant comfort. 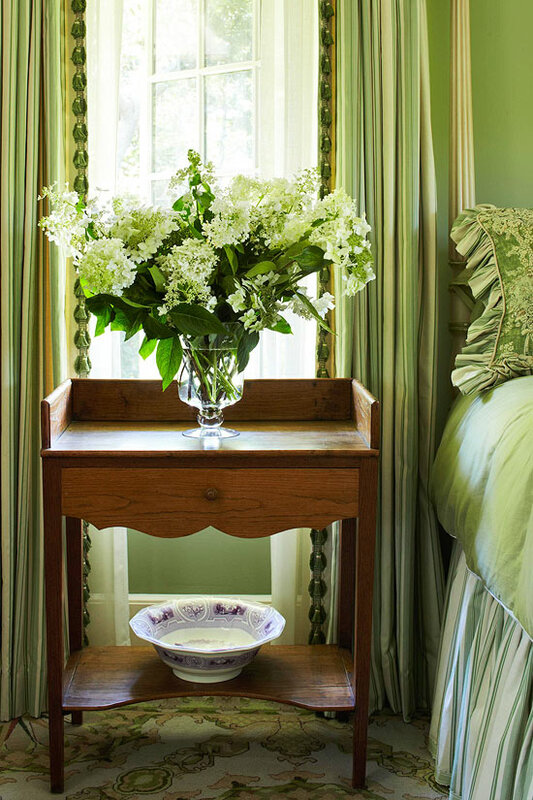 Hampton Summer Home, Fresh Flowers Complement Antique American Washstand by Jack Fhillips Design, Inc. Flowers also play a significant role of bringing the summer in, they offer a nice contrast in color and freshness that appeals to the senses. 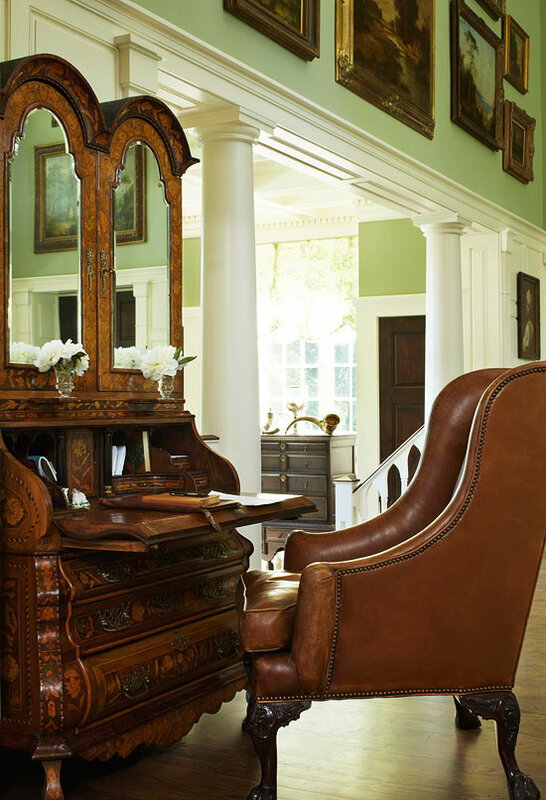 Truly amazing when you study the details that make this summer home stand-out. Hampton Summer Home Gorgeous Antique Mirror-Doored Secretary in the Living Room by Jack Fhillips Design, Inc.
Summer greens are used in perfect balance between the wall colors, fabric cotton prints, upholstered furniture and cheerful antique faux-bamboo chairs with English pads made of embroidered cotton. Hampton Summer Home with Spectacular Gothic Styled Rear Staircase Against Wall of Windows by Jack Fhillips Design, Inc. Spectacular architecture, soaring ceiling heights and the Gothic styled rear staircase are simply breathtaking. 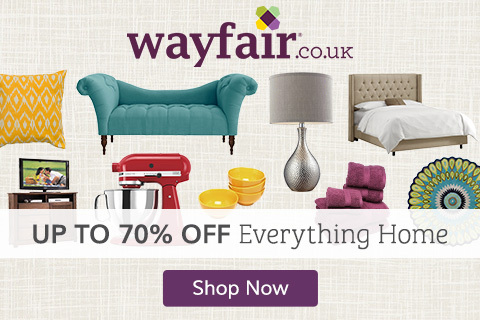 I hope that you are inspired to make a few seasonal changes to your home by adding a summer touch! To view the entire project please follow this link to Traditional Home. 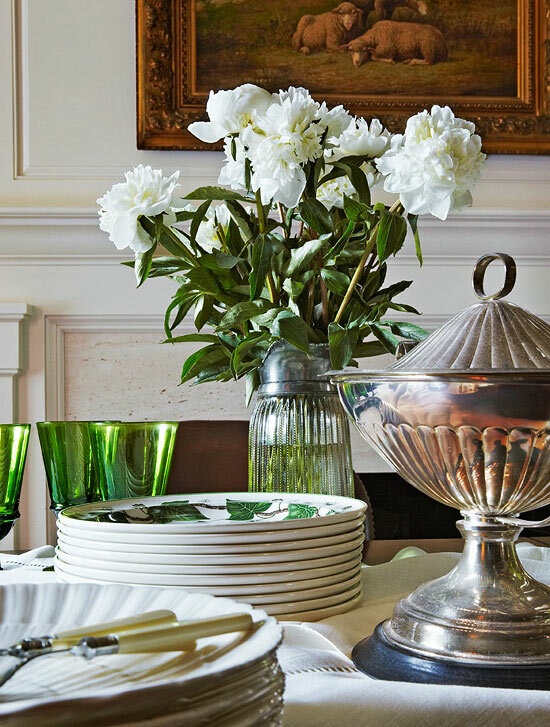 Fresh Flowers Bring Summer into Hampton Summer Home by Jack Fhillips Design, Inc.